Nice little video of Nick Saban's hometown of Carolina, West Virginia. He talks about how everyone knows everyone else, and it provides great insight into what molded him into the coach & person that he is today. This video even has his former high school football coach sharing about Nick Saban's play calling abilities in high school. 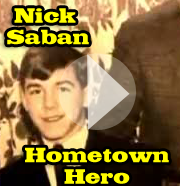 Even to this day, Nick Saban is considered the hometown hero. This video was originally done before the national championship, however it is a great look back into Saban's background. Check it out!